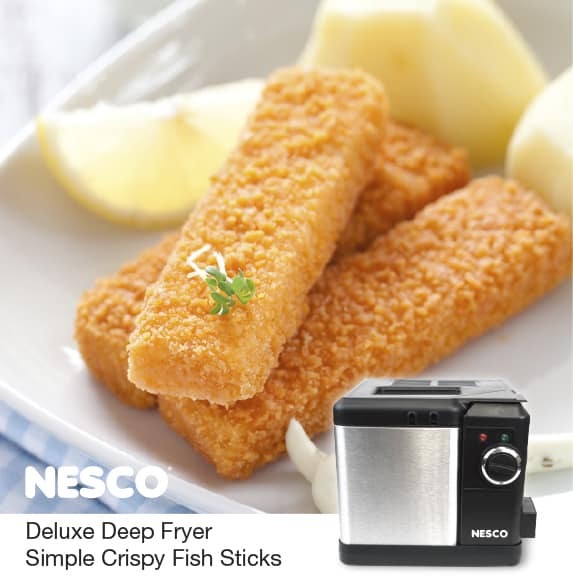 Crispy homemade Fish Sticks are made simple with Deep Fryers by NESCO®. This easy recipe takes minutes to prepare and one you’ll want to have over and over. Remove basket and preheat oil to 300 degrees Fahrenheit in Nesco® Deep Fryer. Cut fish into 1 inch strips. Combine flour, salt, and pepper. Dip strips in flour mixture, then into eggs. Coat with bread crumbs. Lower basket into oil. Use a heat-resistant, metal spoon to place fish in oil. Cook 3 to 5 minutes at 375 degrees Fahrenheit.